This plant is a wonderful example of taxonomy and taxonomic rules. A few days ago I profiled the trumpet jade, which is a variety of the jade plant selected for its morphologically messed-up leaves (you can read all about it HERE). It is native to South Africa, and has (to my knowledge) never been evaluated for its species status. It is likely very secure (meaning there are many individuals left in the wild that readily reproduce), but since I've never been to South Africa I'm definitely not one to comment first-hand. 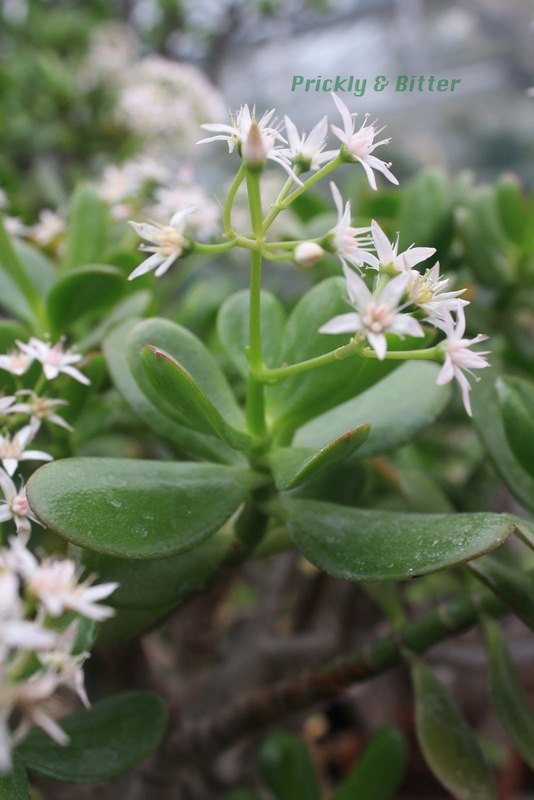 Historically, the jade plant was divided into two different species based on flowers; the pink-flowered plants were placed in Crassula ovata and the white-flowered plants belonged in Crassula argentea. There is also a correlation between colours of flowers and the general shape of the leaves; the leaves of the pink-flowered plants often have longer and more oval leaves, while the white-flowered plants have shorter, slightly rounder leaves. Unfortunately, this was just smoke and mirrors and a great example of how plants confuse botanists. The "rules" that were made up for how to tell C. ovata from C. argentea were 100% artificial, and it turns out they're both the same species. The colour of the flower is controlled by a single gene and there can be gene copies for white flowers or pink flowers. 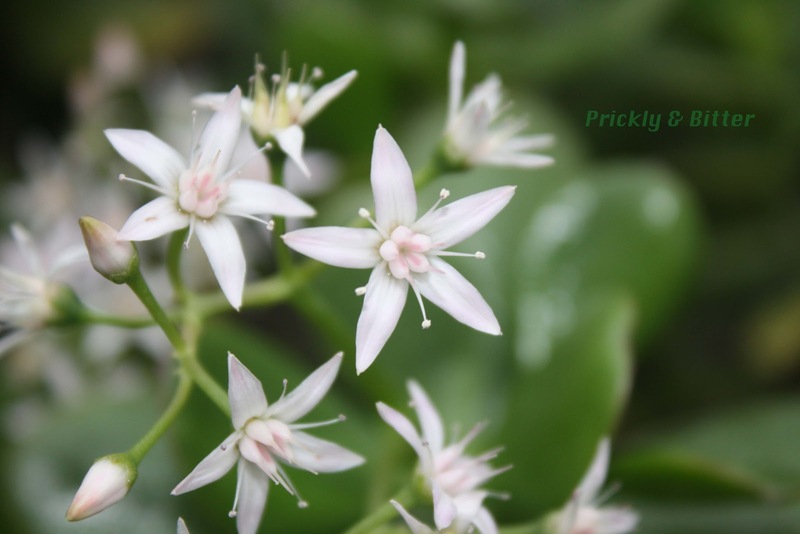 Depending on whether the plant has white genes or pink genes, the flowers can be more white, more pink, or somewhere in between. 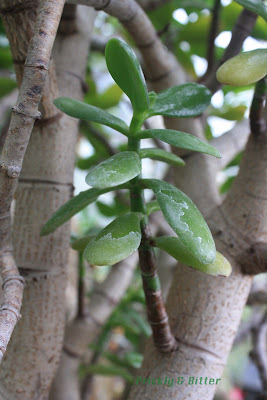 Leaf shape is probably more controlled by level of maturation and environmental conditions than anything else; leaves produced in very dry conditions and high amounts of sunlight will be smaller and more ovate than ones produced when lots of water is available and the temperature is cooler. This jade plant has been masterfully cared for. How do I know this? Look at all the flowers! I've seen the odd flower or inflorescence group on a jade plant before, but nothing like this. One thing that you often have to be careful of when it comes to flowering plants (and some non-flowering plants that are gymnosperms) is that when they "moult" because their health is suffering, it's often mistaken for a sign of great health and prosperity. Some trees are known to do this: the tree somehow knows that it is infected with some kind of disease (insect, fungal, bacterial or viral), produces significantly more seeds than it would under normal conditions, then dies pretty quickly after the big seed flush. Oak trees also do this on an incredibly predictable cycle, which is off-set with population booms of squirrels. When the squirrel population is high, the oak trees need to produce an over-abundance of acorns just to keep up. They moult and over-produce acorns in an effort to overwhelm the squirrels and hopefully reproduce instead of being completely eaten. The results of this effort can sound like it's literally raining acorns. This effort seems to be incredibly successful, since most species of oak aren't at risk of becoming endangered due to squirrel predation any time soon. The moulting of oak trees depends on the species; red oaks are on a 4-5 year cycle and white oaks a 5-7 year cycle. Is this jade plant at risk of keeling over after this flush of flowers? I'm guessing not, but I'm really not sure. If it's mysteriously absent from the greenhouse in 8-12 months, then I think I know why! 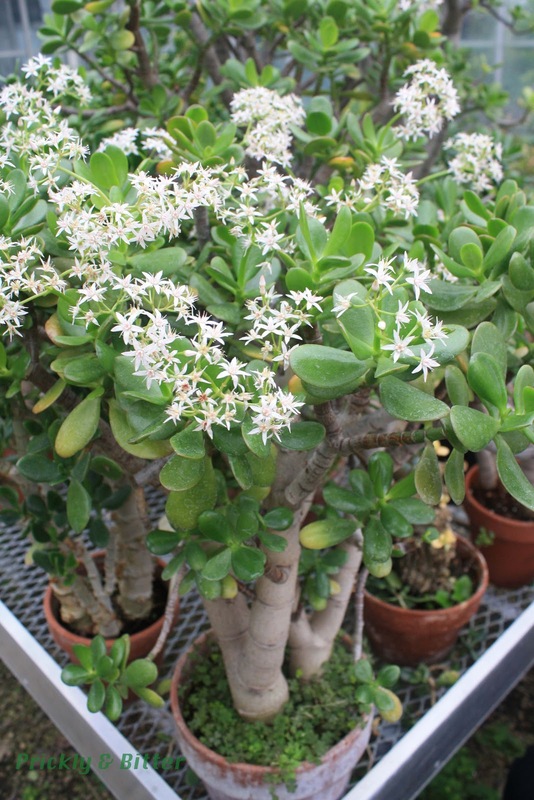 If it's still there, then its just a well-loved jade plant.